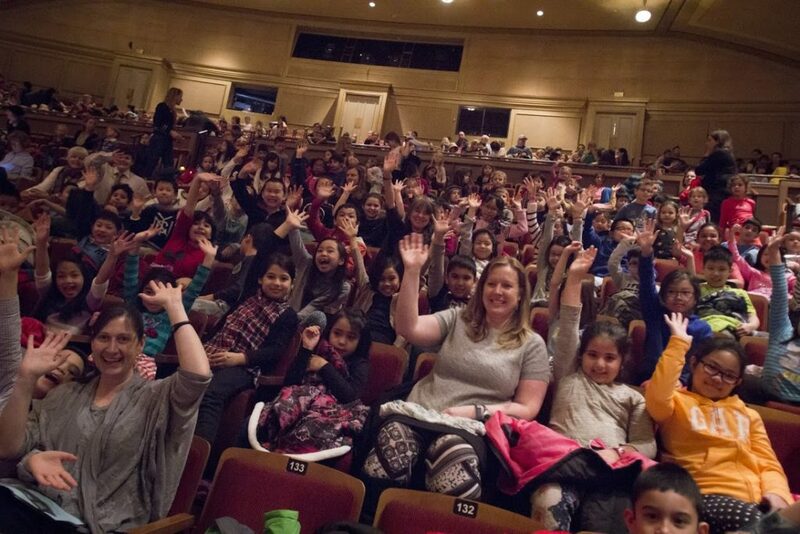 Each season up to 35,000 students from over 400 schools and home-schools attend the Vancouver Symphony’s Elementary School Concerts. An entertaining combination of orchestral music, theatre and video technology, the VSO school concerts provide students from kindergarten to grade 7 with a fun, educational and interactive live music experience. ANNOUNCING THE 2018-2019 ELEMENTARY SCHOOL CONCERTS! Please Note: We will be accepting orders paid in full, or with a non-refundable deposit of 10% from September 4, 2018. Come celebrate the classics with the VSO! This concert is full of symphonic chart-toppers and treasures of the orchestral repertoire. With masterworks by composers including Mozart, Beethoven, and Tchaikovsky, learn why these musical pillars have earned a permanent place in our orchestral hall of fame. Join us for Sergei Prokofiev’s enchanting orchestral tale, Peter and the Wolf, as well as other beloved symphonic stories. Learn about how different instruments can bring characters to life and how an orchestra can take us on a magical, musical adventure! Please note that the March 6 at 10am and March 8 at 10am performances are full. Video screens, located on both sides of the Orpheum stage, integrate into the theatrical element of our concerts and provide students with close-up shots of the orchestra, conductor, and guests as they perform. Study Guides, track downloads and bonus features, designed to prepare you and your students for the concerts, are free online. We encourage you to take full advantage of the free downloads. If you do require a hardcopy, they are available to purchase for $19.95 each. Online ordering – fast, secure booking option. An inside look at the VSO’s Elementary School Concerts, with thanks to TELUS, our premier education partner. The 2018-2019 Elementary School Shows are sold out. Thank you for your interest. Please check this page soon for information on next year’s concerts. Here’s some answers to the most commonly asked questions about the Vancouver Symphony’s Elementary School Concerts presented by Industrial Alliance Insurance and Financial Services Inc.
Telephone reservations will not be accepted. Where are the concerts held? At the historic Orpheum Theatre in downtown Vancouver, located on the corner of Smithe and Seymour Streets. Please use the Smithe Street entrance upon arrival. What time do the concerts start and how early should we arrive? We have two performances scheduled daily when presenting elementary school concerts and they begin at 10:00am and 12:00noon. The doors will open 45 minutes before each performance so please arrive in plenty of time to be settled in your seats 10 minutes before the concert begins. Teachers: One teacher per class admitted free of charge. Special Needs Assistants admitted free of charge. Chaperones: One guest per 10 guests will be free. We are pleased to inform you that the ArtStarts Cherniavsky ‘Mr. Music’ Fund offers grants to schools to assist in purchasing student tickets to classical music concerts. Please be aware that the deadline to apply is early November. For more information, visit www.artstarts.com. Full payment is require no later than 3 weeks before the concert. You may choose to pay in full, or hold your seats with a non-refundable 10% deposit, the remaining balance to arrive 3 weeks prior to the concert. VSO Education reserves the right to cancel any order submitted but not paid for by the payment deadline. Refunds are not given except in the event of a cancellation by the VSO. Seating is assigned on a FIRST PAID IN FULL – BEST SEATING basis. Deposits hold your preferred concert date and seats are assigned as complete payment is received. Can we eat our lunch at the Orpheum? Sorry, no food or drink is allowed throughout the Orpheum Theatre. Alternate locations may be Robson Square (if weather permits) or the large public lobby of the Vancouver Public Library. Both are 2-3 blocks from the Theatre. Is there study guide material? Study guides, support material and music files will be available to download in September from the Elementary School Concerts webpage. Hardcopies of the study guide package can be added to your order for $19.95 per pack. Can we take pictures of the orchestra? Sorry, no cameras, video or tape recorders are permitted in the hall.